Today: There's a lot to learn about parchment paper. Despite instructions to the contrary, you don’t need to grease the pan under a parchment liner, nor do you have to grease the parchment itself before pouring the batter onto it. Exception to the rule above: When baking cookies on parchment lined cookies sheets in a convection oven, you may need to secure the corners of the liners to the pan if the cookie dough is not heavy enough. For meringues or moist light batters, use a dab of the batter under the corners of the parchment to secure the sheets. Make your own cake pan liners: stack a few parchment sheets on a cutting board. Set a cake pan on top and cut around the pan with an X-Acto knife. Repeat until you have a nice stash. Store liners in a cake pan or a manila envelope. Parchment paper will improve the performance of cookie sheet that is too thin or too dark: if cookies are burnt on the bottom and undercooked on top, lining the sheet with parchment will help. Try two sheets if the condition persists. Buy a better quality baking sheet in the morning, or as soon as possible. More: A good place to start? 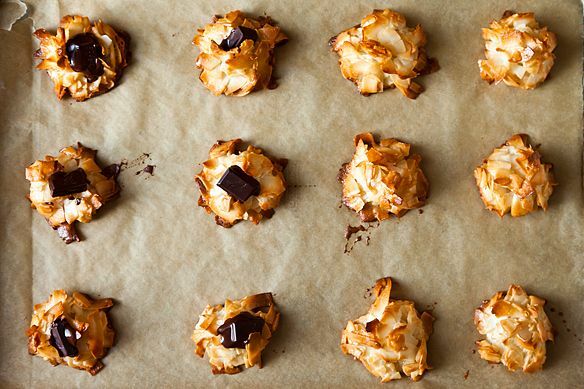 Alice's genius coconut macaroons. Those cocoa brownies are the best! And I loved the tips here for parchment. One other one I would like to add is for making pizza at home. Prepping the dough and toppings onto a piece of parchment on top of your peel - makes an easy transfer to the hot pizza stone. And you can slide it off the parchment once the crust sets. This has made for thinner crusts and also the oven stays nice and hot because the transfer to the stone is fast - allowing you to close the oven door quickly. Yes, and you don't even need a peel, really. I use a cookie sheet with one open side. Easier to store, works just as well. ;o) P.S. I agree, too, that those cocoa brownies are incredible. They are my go-to since I first made them. A few weeks ago we had a dinner party for a bunch of my older son's friends (all in their 20's). Dessert was a brownie topped with vanilla ice cream topped with whiskey caramel made using the recipe on this site. Success. 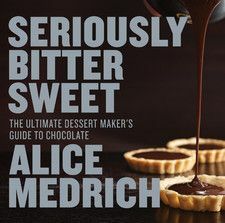 What a great article, I'm making Alice Medrich's Best Cocoa Brownies right at this moment, they are in the oven baking in an un-greased parchment Le Creuset stoneware pan, as recipe says :) Can't wait to taste them. I spray cooking spray on the cookie pan itself. I then put the parchment paper down on the cookie tray. The parchment paper sticks to the pan. It doesn't curl up. The only reason I grease the pan before laying down a parchment liner is to keep the parchment from curling or moving around in the pan while I pour in batter or whatever. It holds it in place very nicely! Jaime Oliver always wets and crumples a sheet of parchment up before using it. Does anyone know why? He does that when he's using it as a lid or cover for food, not to go underneath cakes or cookies. The dampened parchment help food retain more of its own moisture, but unlike covering it completely (with a lid or foil, for example), it still lets some of the moisture escape. Wow that's pretty fascinating, thank you for sharing. Great tips. I am always greasing the parchment for cakes - I was pretty sure I didn't have to but I just can't get myself to stop doing it, especially since most recipes tell you to! I just might "risk" it next time and see how it goes! Forgot to mention that those parchment cutouts and strips leftover from fitting the paper to the size of the pan make a great cushioning for shipping cookies this time of the year. I just crumble them together and compact them enough to leave some air in between them and pack around in the box. Oh, haha, me too - I love you guys! We should have a poll on this; who uses only once, twice, as many times as they can get away with; includes cutting off the black part overhanging the pizza stone…and then uses that for packing cookies?! …to give to a cook-friend this upcoming April Fools Day!